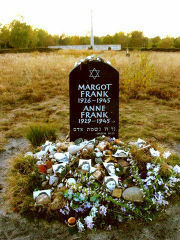 The grave of her and Margot. . Wallpaper and background images in the Anne Frank club tagged: anne frank photo. This Anne Frank photo contains 墓碑, 墓石, and 墓碑墓碑. There might also be 标志, 海报, 文字, 黑板, and 文本. Rest in peace you beautiful darlings. If only you could have stayed alive just a few more weeks, and seen the liberation of that horrible death camp.